My faithful readers of “Restore” may remember my embarrassing confessions in my June newsletter “REarrange: When the Furniture of Your Life Gets Moved,” wherein I shared my psychotic reaction to impulsively donating all my office furniture. This article is the update on my upgrade! My undone room was challenging me to be okay with all that’s not figured-out-yet. It wanted to know if I could live with the unknown, with what’s ahead, with what’s unseen, and still be O.K. And now it is empty. And then it occurred to me!!! It’s a space that the future has to fill. This Empty Room has revealed to me my own discomfort with waiting, with NOT knowing an outcome. Even in that empty room, I bumped into my default dislike for not having answers. Standing outside myself, I was able to watch my frantic self trying to get things “back to normal,” trying to get to the new, improved version. What if we force fit a “suitable solution” in our discomfort that actually hijacks the solution that was lovingly reserved for us in the future? I am choosing an upgrade today. This is not about my furniture or an empty room. This is about my willingness to LET GO and let Love teach me that GOOD is always coming to me. Friends, when you let moments of your own hysteria reveal hidden, limiting mental constructs and then you CHOOSE to remove them, you qualify for an upgrade. And that upgrade has been reserved for you….in love. A friend of mine read my “REarrange” enews and reached out to me with an offer to help with my “problem room.” A designer, decorator, a repurposer. A kindred spirit. Apparently she took pity on me. You know what I mean – a friend who you admire and whose presence is a joy. Yet, someone who you long to know MORE; someone whose depth of friendship you know in your “knower” is a treasure chest yet to be opened and discovered. We were ships passing by one another, each with our own demands of life, exchanging smiles and hugs as our families and work carried us along like a current, in seemingly variant directions. We had a friendship with an ellipse….. So, when she reached out to me about the Empty Room; I knew in my knower that my room was bringing me heaven’s moment with my Friend. And from this moment, fabric, ideation, and dreams have unfolded. Selflessly, my Friend has taken my room into her own heart and made my emptiness her drawing board. Sacrificing her free time (for me!!) and with a determined energy bubbling up from her depths, she has hunted the city and internet, supplying a constant stream of ideas and possibility. Between endless pressing responsibilities of her own, she has made my need her need. Each of her arrivals to my office is a love delivery. She has shabbied a chair she found. For me. She has stripped my old ripped lampshade into a deconstructed delight. For me. 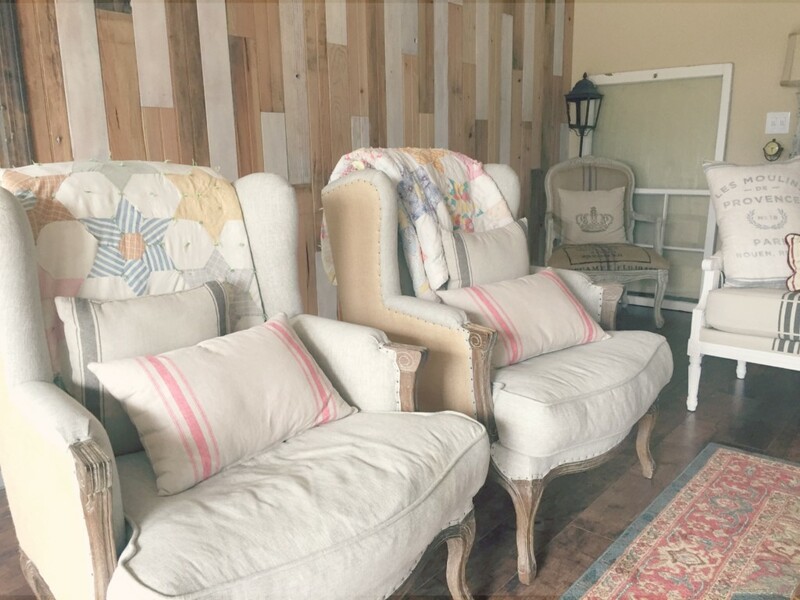 She found my dream arm chairs on a trip she took just to shop. For me. 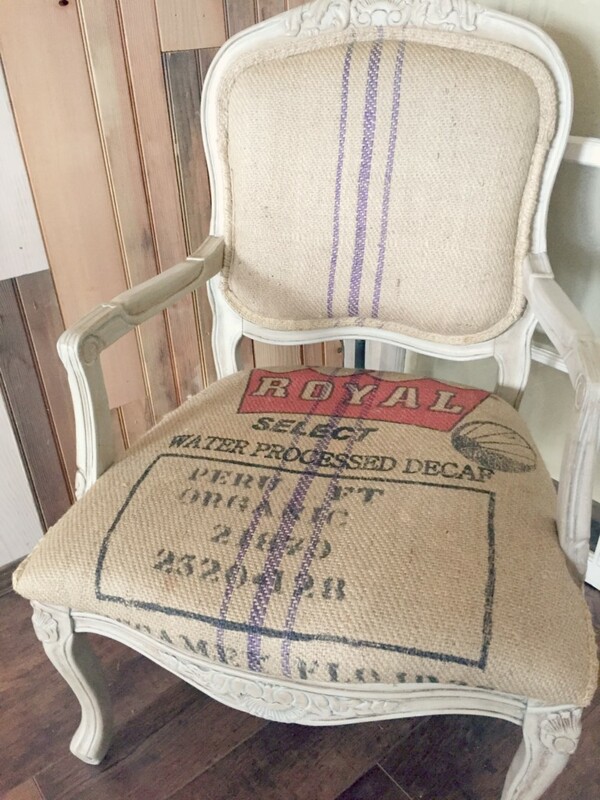 She has tried (for the first time ever) burlap reupholstery. For me. She has been thinking about that weird open cabinet and brought a drape that can be folded just so and hung with a pole, which she brought and assembled. For me. 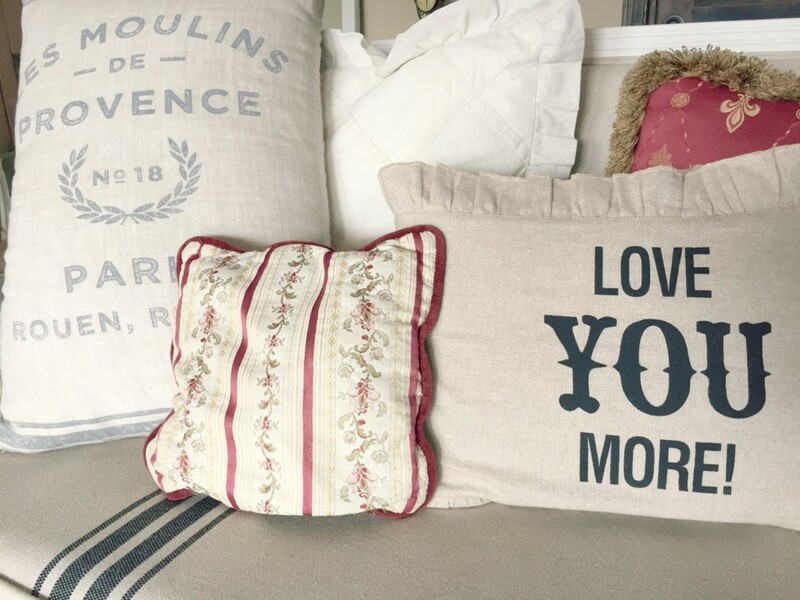 She has taken my tired and worn pillows and recovered them from placemats and napkins she found and “just knew would be the perfect thing.” For me. She stumbled upon this rug that she knew would tie the pieces together and buys it with her own money. For me. All I did – fancy professional organizer that I am – was fumble around and try to help. Humbled by the effort I didn’t even possess that had been expended on my behalf. And what started as an office “updo” bled into my conference room, the bathroom, the family, room, the bedroom, and beyond. Because Love knows no fences and busts down every door. What in the world had I done to deserve this attention? This kindness? I had been myopically busy in my own world and life. I hadn’t planted anything in her or for her. This was not a return on investment. Not an exchange of value. Not even a barter. I had given her nothing except the affection I had for her. She shuts me out of the formerly Empty Room. For an hour, things are shoved and stacked and rearranged. Then, she opens the door and introduces me to heaven. Tears fall down as I behold what Love does. And all at once, I see that I am being fed from the garden of love of who she is. I am sitting and drinking tea and reclining in the atmosphere of love that her sacrifice, her attention to detail, her sharing-of-my-burden created. What if the sheer effort and planning and delight that my Friend expended on my behalf is reflective of the ongoing, bustling, and joyous plans of heaven on our behalf? What if there is scurrying and gathering and giggling going on in heaven as ALL the supply for YOUR need is being assembled? What if there’s a big unveiling just around the corner for YOU? Too often, our HEARTS are just like my angst-filled Empty Room. They’re wondering why they’ve been stripped. They fear it will never be quite the same. They’ve struggled to fill themselves to no avail. They’re aching for love to fill them. Back when I “impulsively” let go of the familiar, my inner man knew something my outer man did not yet know: the answer to my emptiness really WAS in the future. But I had to wait a half a year for my solution to present itself. I had to yield striving and believe that a solution WAS coming. I had to face my own deep-down discomfort with waiting. I turned my cheek to The Quiet and went about my business with the awkward Empty Room in the background. Do you have unfinished awkward business on the back burner? Take heart, my Friend, Heavenly Plans are underway for YOU! If you can just accept that truth, it will help you endure The Quiet. I also had to REceive – to get (“ceive”) again (“re) from someone else – this upgrade was given, it was carried in the heart and hands of someone else. It was a gift from heaven that I had to receive. It was not something I was meant to DO on my own and figure out all alone. It was so much more extravagant than I would have given to myself. I would not have given myself the luxury of hunting down all these treasures and spending money on myself in this way. I would have stopped once the practical needs of the room were met. But it took two of us to dream up this space and call forth the beautiful details that make it perfect eye candy. 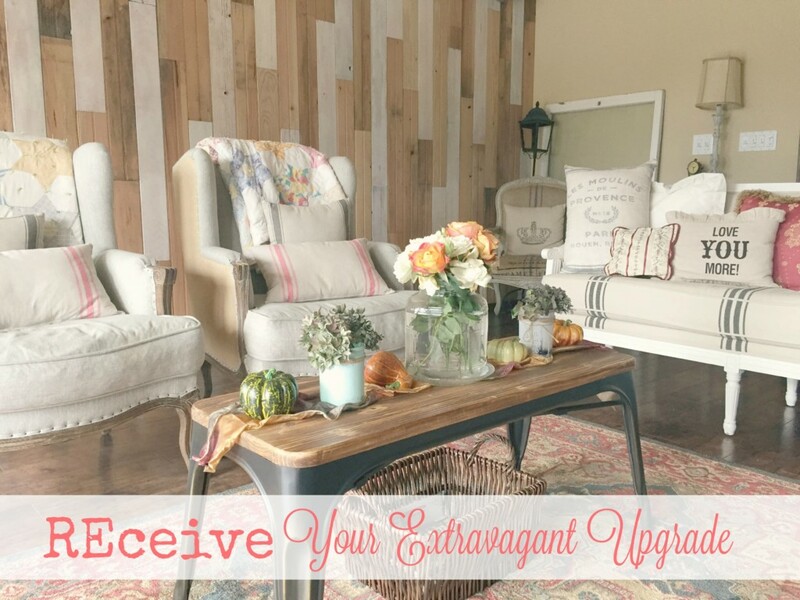 This room upgrade (that spilled over into the rest of my home and heart) was extravagant not just in the gifts I received and in the seemingly endless love deliveries, but in the sheer abundance of it all. By letting go of the familiar and yielding my own effort, I didn’t just get new office furniture. I beheld Love at work. I came to understand that Extravagant Love is – and has always been – working on my behalf. Even when I couldn’t see it. Even when I was on the hamster wheel trying to fix things. Even when I had given up. The plans of heaven were still in motion. For me. This, my Friends, is the Power of Love. We each have the power to display for one another the glorious manifestation of the bursting favor, detailed individualization and tender affection of heaven. Those who walk in fullness are invited to participate with Extravagant Love and bring heaven to earth for others. What greater joy is there? And when we receive THIS kind of love, it is an encounter that changes us. It rewrites our emptiness with fullness. I hope each of you gets to experience this very personal upgrade that I have received when the furniture of my life got rearranged. Read Vicki’s book “Restoring Order to Your Home” to learn about making your space work for you! Beautiful post, Vicki! I love that Christ fills all our Empty Rooms with ROYAL burlap-upholstered furnishings of His unfailing love. An extravagant upgrade, indeed! The photos filled my soul with peace. What love! Lynn!!! Thank you SO much for your kind words. It means so much, especially from another author who sends “love letters” into the world through writing.